When I was younger (late elementary school, early middle school aged) my stepfather, who was a freelance writer, got a job writing video game reviews for Parenting Magazine. What it meant was that my stepfather - and therefore me - was sent, free of charge and for keeps, all the latest video game systems and video games to test. So all of a sudden, I had just about every game I could ever want at my very fingertips. Obviously this has been the highlight of my life so far (I'm now 24 and can't think of anything else that even comes close to this, although college was kind of neat). But coolness factor aside, one of the extra perks was that we occasionally received games that had not yet been released on the market. Bonk's Adventure was one such game. I think the reason I initially liked the game so much was because of the look of the "prototype" cartridge. Unlike the normal streamlined Hu-Cards, this was a bulky, green electronics board with all the fixin's: microchips and transistors poking out all over the place, real solder, I think there was even a diode, although I really have no idea. It was about 5 inches long and needed a special notch cut into it so you could slide the power switch of the turbo-grafx over enough to turn the thing on because the game stuck out so far from the input slot. So that was awesome enough for my little, 12(-ish) year old mind. And then I started playing it. What a game, I mean the look of it, the music, the crazy story, the bald-headed flipping freakshow who is bonk...but you know all about that. So I played and played and played. I figured out how to get 99 lives in the first level, I learned to love meat, and I had a grand old time bashing tyrannosaurs with runny noses. And then I was in space. It took a couple of tries, but I did beat King Drool (misnamed Google Eyes in the credits of that first version) and there was much rejoicing. Of course, the first thing I did afterwards, proud child that I was, was tell my stepfather all about it. And, proud stepfather that he was, he called his contact at Hudson directly and told them of my accomplishment. As it transpired, no one in their offices had gotten through the game yet, and they had not sent out any other copies of the beta version. So all of a sudden I went from being a little boy excited that he had just beat a video game to being a little boy ecstatic that he was the first person in the world to do something. Hyperbole aside, it was a pretty fun day. So there it is, that's my big accomplishment in life: first person to ever beat Bonk's Adventure. You can believe this story if you want to, all I can do is say that I really am being honest here. As an extra added bonus, I'll send you a couple of pictures along with this story. I saw on your website that you were looking for more information on Bonk Merchandise. Well, I'm not sure where I got it originally, I think it was part of a promo package my stepfather got for his work with NEC and I just inherited it, but it may have been bought as a gift or something when I was younger. 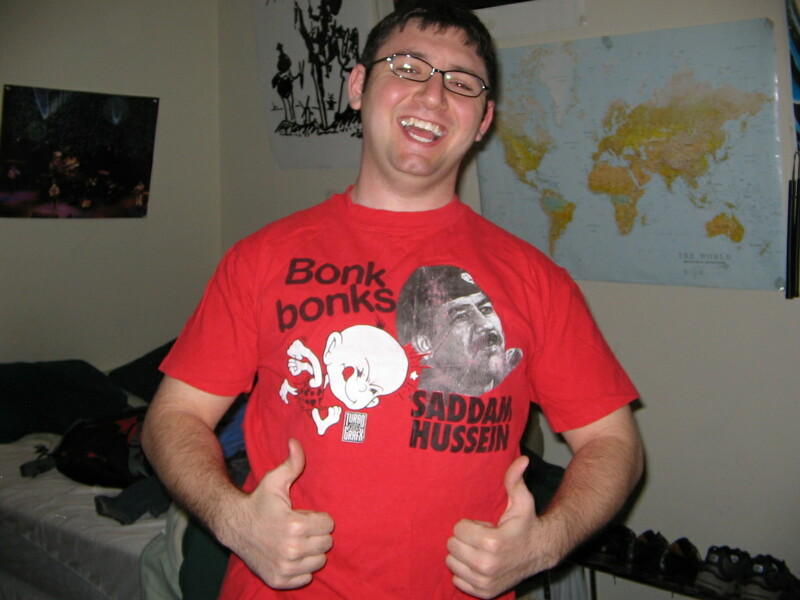 At any rate, it's a T-shirt, fire-engine red, with a picture of Bonk bonking Saddam Hussein. Yup, I couldn't make something like that up: "Bonk bonks Saddam Hussein" you can see for yourself. I hope you enjoyed the story and the pictures, and thanks for putting together the website, a guy like Bonk deserves way more credit than he ever got. Here's hoping they re-release the games sometime soon! hmm...I was just thinking, I don't know what the deal was with the japanese release of Bonk's Adventure, so maybe my claim at being the first in the world wouldn't hold up in court without further research. still, I think I'm safe with the first to beat the English version.